Chi Man is using Smore newsletters to spread the word online. Ceramics are artworks made when clay bodies are permanently hardened using high-temperature, in a process called firing. Their history can be dated back as far as 12000 BCE, they were also initially produced as functional items, such as pots, jugs, and bowls, but the form has developed both aesthetically and technically, so their designs change over time as time progresses due to the evolving creativity and technology. Clay is a highly malleable sort of substance that is quite often made from below the ground's surface. Clay is used to make most types of ceramics and they can be seen during excavation of roads and houses. There are many types of clay, with the most common being red earthenware terracotta clay ("baked earth" in Italian), some include plasticine, paperclay, modelling clay, stoneware, porcelain for example. Traditionally, ceramics were designed for the purpose of storing food and liquids, and their shape was governed by function. An example of this can be a round bowl shape for food or a jug, having a curved lip for it to be able to pour water perfectly. The first ceramic pots were hand-crafted with rolled coils and fired on the ground in bonfires. These coil pots were some of humanity's first inventions, and they remain one of the best records of different civilisations and cultures due to their durability of the fired clay. A lot of the earliest known pottery are from the Middle East regions, where fragments have been carbon dated to 9000-12000 BCE. This early work was earthenware with no glaze and had the texture of a basket weave, suggesting it was used as mould to make the shape as well as to create an embossed decoration on the pots. Ceramics can be made from a variety of different types of clay to make artworks that can range from being very delicate to being heavily textured and expressive (effectively conveying thought or feeling). 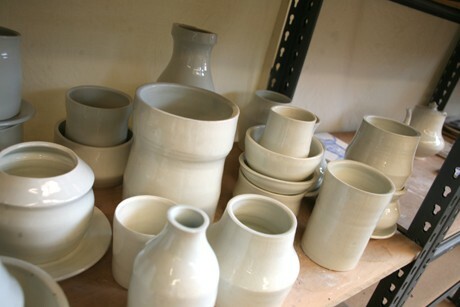 Ceramics are able to enhance their artwork through different firing techniques and decoration through a process known as glazing. In order for clay to become ceramic it needs to go through two important stages. The first part is Bisque firing, which involves the clay being put into a kiln and heated up to 980 degress Celsius. The next part is glaze firing, which involves the bisque work being coated with liquid glaze and placed again in the kiln, but this time set at 1100 degress Celsius. Over time, the glaze starts to melt during the latter stages of the firing to produce a glass-like surface that seals the ceramic object, effectively hardening it. There are many clay-making techniques, some include making wheel-thrown pieces, slip casting, coiling, sculpting, and slab building. Not all ceramic artworks need to be completed using ceramic materials such as underglazes and glazes. After your clay has been bisque fired, you are free to decorate it using acrylic paint.